After much stress and deliberation, we are going to postpone this event until April. This was an incredibly hard decision. I talked with Crea a lot and I sought input from many. Rain or shine we do have an amazing reason to celebrate and I know everyone would have braved the rain. In the end, the space we are using will be very crowded if 80 of us are inside the house. The main reason, however, ties to the fact this is a 'Sunny' occasion that warrants a good day where we are all hanging out and enjoying the deck and the fire pit. We were going to BBQ outside and that would also be challenging. Lastly and most importantly, Crea could use a little more healing time and I am sure she would love her bandages to be off so she can really feel this is all behind her. I was worried everyone would be upset that we postpone so I really hope you understand and I really hope you can make it when the date is finalized. Your support has been incredible and TRULY has helped us both to date. We still have an amazing reason to celebrate and look forward to doing so with you. We will still have amazing food and an amazing list of drinks at the bar (plus beer and wine of course) with bartenders to actually make them for you, s'mores will make a very special appearance at the fire pit, we will still have a raffle and hopefully we have some amazing weather! Let me know your thoughts. Thanks for understanding. If you want to donate in honor of Crea now, you can get to the link above. 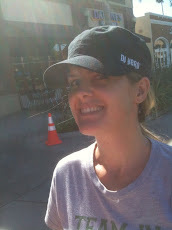 In case that doesnt work, you can go straight to the site at http://pages.teamintraining.org/los/lavatri10/4mywife . You can also wait for the party and you also dont have to give at all so please feel NO pressure. Before I part, a special thanks to Jesyka Lueck who offered up this party as a way to help and offered up her time and the time of her friends to make the party successful. The same thanks goes to Lori Jomsky who jumped in to help make things happen and secured a ton of donations so that we could eat really really well at the party. Thanks to Nick and Jon for opening up their home to all of us for this event.....still waiting for them to let me move into this amazing house and lastly a thanks to Chris Schauble......our favorite NBC morning anchor who got the real scoop on the weather for me so that we could more soundly make this decision. Last thanks goes to my amazing wife Crea for putting up with me, for being my best friend and for being an amazing mother to our children. We cannot wait to see you guys in April to celebrate a cancer free wife and make strides to a cancer free world! 1. No need to apologize for postponing it ... it's a celebration of her successful battle, but she needs a little time to recover from that battle. Anybody who has a problem with that wouldn't be going anyways!